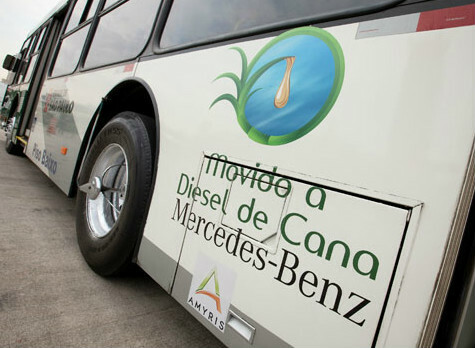 Preliminary results of the project Diesel Cana – Towards 2016, developed by Amyris Brazil will be released by the Federation of Passenger Transport Company of the State of Rio de Janeiro (FETRANSPOR) in the United Nations Conference on Sustainable Development, Rio +20 in June. The project started in January this year, with tests on 20 buses on the addition of 30% diesel obtained from sugar cane. But the goal is to raise that number to 30 buses this year, according to FETRANSPOR. Initial assessments of the project will be made to the Rio +20 by researchers at the Department of Graduate Programs Engineering, Federal University of Rio de Janeiro (Coppe). According to to the manager of FETRANSPOR, William Wilson, the tests carried out analysis of fuel, mileage, consumption, maintenance, perception of performance, emissions and reduction of costs. The perspective is to reduce the emission of greenhouse gases by 90%.